[翻译] When you think of Macau, you would associate this former Portuguese controlled region for the glamour of Las Vegas. Except Macau has a fantastic dining scene from fine to street food like its neighbor Hong Kong. On the fine dining spectrum, 8 at Grand Lisboa Hotel is a glamorous 3* Michelin rated restaurant (since 2014. up to its current list for 2016) in Macau. 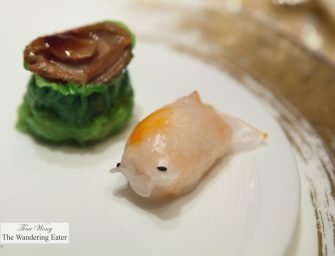 It’s a very sleek restaurant that does serve the best dim sum I ever ate. Ever since that having 8’s dim sum, every other dim sum meal didn’t match up the deliciousness of what we..